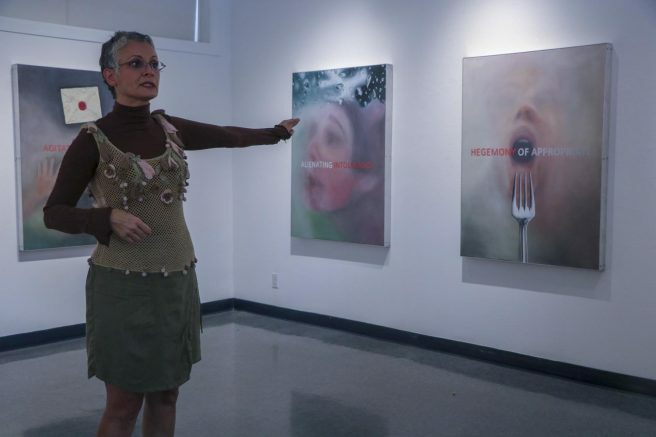 The new exhibit “Considerations Sanity In Surrender” at the James Kaneko Gallery is an individualistic journey into societal struggles in which artist Haleh Niazmand reveals her experiences as an activist, artist and mother of a child with autism. “What happens in the United States, what happens in Iran, what happens around the globe, is the way I work,” Niazmand said to the audience about the importance of using art as a medium to communicate subjects that matter. Derrick Powell, art and financing major, said he was intrigued by the piece. Niazmand said that all of those “-isms” become a group of words that define methodologies or ways to define how groups of people embrace particular ideas and how those ideas have consequences. “I always have seen that at the center of all of these other -isms is capitalism with the way it controls our system today,” Niazmand said. 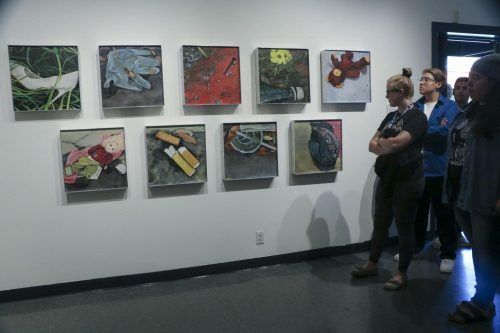 The next group of paintings consisted of nine small “stories” inspired by objects the artist found around her neighborhood during the time she lived in Oakland near the Fruitvale BART station. “[The paintings] became almost like little statements especially by the time I found the [high heeled] shoe in a little grassy patch by my art studio,” Niazmand said. 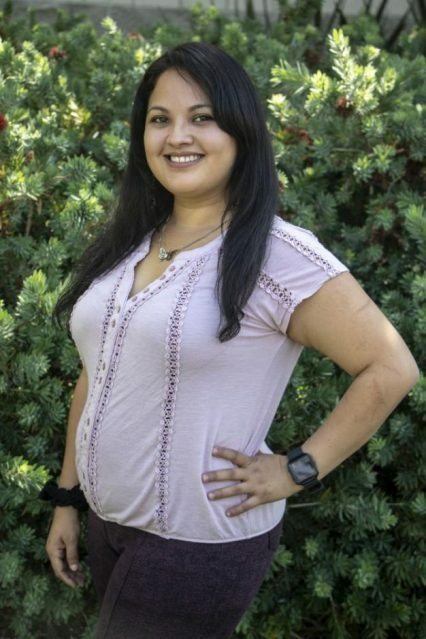 Niazmand said that she witnessed that the area was a hub for prostitution and child prostitution trafficking and made her think if it belonged to a prostitute running for her life, she said at the reception. Niazmand then signaled a painting with a little doll she’d found thrown with garbage in the area, to which she related to the housing crisis. The last section of the exhibit is a group of large oil paintings on linen. Niazmand used photographs of her partner, herself and her son as the base of the paintings, and then with text and symbols “on the other side of the glass” creates a “barrier of space” to portray her experiences raising a child with autism. Each painting has a two sided meaning coming from empathy and no judgement because “Whenever you separate members of society from one another, you are going to create prejudice on both sides,” Niazmand said. Jade Jacobs, a fine arts and gallery certification student, said that it was an honor to help the artist set up the show. The artist spoke about the importance of creating art with purpose and the influence of major museums, which she said are more interested on the “spectacle” of “major league funded art” than art that produces meaning and moves people. “We’re a society that [doesn’t] care about art. We need to look at the history of the type of art that has been promoted,” Niazmand said. Jacobs said that ARC students should not miss this exhibit and to read the artist’s statements because Niazmand experiences tie up with the paintings. “I love everything that she has to offer and with this being something that’s not imaginative on a level by everyone on a mass level, it’s very individual and I loved that,” Jacobs said. “Considerations Sanity In Surrender” will be on display at the Kaneko Gallery in the Fine Arts building until it’s closing reception on Oct. 18 from 5 to 6:30 p.m. The Kaneko Gallery is open Monday to Thursday 11 a.m. to 4 p.m. and Fridays from 11 a.m. to 2 p.m.
Be the first to comment on "From the other side of the glass: ‘Considerations Sanity in Surrender’"